- How long are they worn? / How often? / Post-treatment wrap up. / Difficulties with uneven whitening. How to perform individual treatments. - How long are the strips left on? How often are they used? What activities can you do while wearing them? Possible solutions for uneven whitening. Steps to take when terminating your treatment session. A) How long should you leave your strips on? Once you have your strips positioned, your bleaching session has begun. So, take a look at your clock and start timing. While the way you use all Whitestrips® is essentially the same, the application times for the various product versions are entirely different. As you can see in the table below, times range from 5 minutes all of the way up to 2 hours. A part of this difference is due to the fact that whitening strip products can vary substantially in the concentration of peroxide that their whitener contains. And that means staying within your product's guidelines is not just a "best results" but also a safety and side effects issue too. In all cases, you must refer to the instructions that have come with your specific product for directions about how long and how often your strips should be worn. 5 minutes, once a day strips. 30 minutes, once a day strips. 1 hour, once a day strips. 2 hours, once a day strips. Note: Products, as well as product names and versions, can change so be sure to check your instructions. You can always wear your strips for less time. The treatment times stated above are the maximum duration your strips should be left on. You can always wear your strips less. For example, you might do so as a way of managing side effects. The trade-off is that you'll get less whitening effect per strip. And that means to reach the same whitening endpoint, you'll have to purchase additional product. The number of applications per day shown above seem to be Crests® standard recommendation for use. Information on their website states that their 3D White Whitestrips® Vivid, Advanced Vivid, and Professional Effects products can be use up to twice a day (30 minute application time each session). This same page also states that 3D White Whitestrips® Stain Shield and Gentle Routine are only once-a-day products. We don't have information on other types of Whitestrips®. We discuss this topic in greater detail below. B) What activities can you do while performing your treatments? You can do pretty much anything you want while your strips are in place, so long as it doesn't dislodge them. And if you chosen one of the Advanced Seal® or FlexFix® style of strips, you may not be limited much at all. For obvious reasons, you shouldn't smoke or eat while performing treatments. Drinking doesn't make a good choice either. Even if the strips stay in place, the liquid might dilute the whitener to some extent. Wearing your strips during times when you'll need to do a lot of speaking, especially in public, might be problematic. You'll just have to experiment. No matter what you decide to do, it's a good idea to check your strips every once in a while to make sure that they are still in place. And, for reasons discussed previously, if you do find that you need to touch your whitening strips, make sure that you rinse your fingers off afterward. C) Excessive salivation can be a nuisance. Wearing whitening strips is no exception to this rule, and the increase in saliva can be a nuisance. The build up of liquid tends to make treatments a bit yucky. It can also make it difficult to keep the less adherent style of strips in place (especially the lower ones). There aren't a lot of solutions for this problem. But the good new is that your response should tend to diminish over time. Focusing on some other task (rather than the fact that you have strips in your mouth) can help to make things more tolerable. So, maybe your treatment time would also be a good time to balance your checkbook, wash the dishes or mow the yard. A) Removing teeth whitening strips. You'll want to discard your used strips with some care. It's likely that at least some of the hydrogen peroxide whitener (bleaching agent) on them is not totally depleted. Always wash your hands after handling teeth whitening strips. Residual whitener can be brushed away. B) Clean your teeth and gums. Once your whitening strips have been removed you should rinse, wipe or brush away any whitener residue that remains on your teeth or gums. Wash off your fingers, toothbrush, etc... after you've finished cleaning. As mentioned above, information on Crest®'s website states that their 3D White Whitestrips® Vivid, Advanced Vivid, and Professional Effects products can be use up to twice daily, 30 minutes application time each session. The advantage of performing more than one session per day is simply that your whitening process will occur more rapidly. The tradeoff is if you do, whitening side effects are more likely to occur. B) Spreading your sessions out can help to minimize side effects. There can be good reason for you not to perform multiple whitening treatments each day, or even treatments on consecutive days (when allowed by your product). 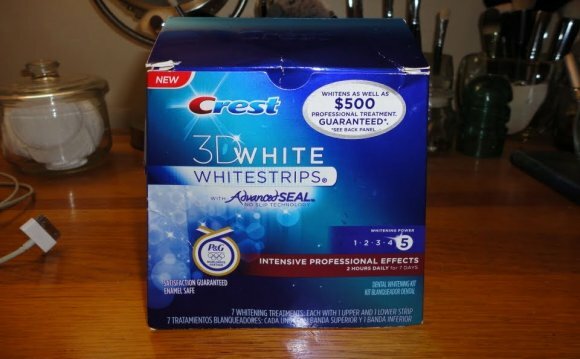 A person's potential to experience whitening side effects correlates directly with their exposure to the whitener within a specified time frame. As a way of helping to minimize or control side effects, allowing extra time between sessions can be beneficial. C) Is it OK to wear teeth whitening strips longer than their directions state? It's never a good idea to use any tooth whitening product in a manner that lies outside the guidelines specified in its directions, teeth whitening strips included.